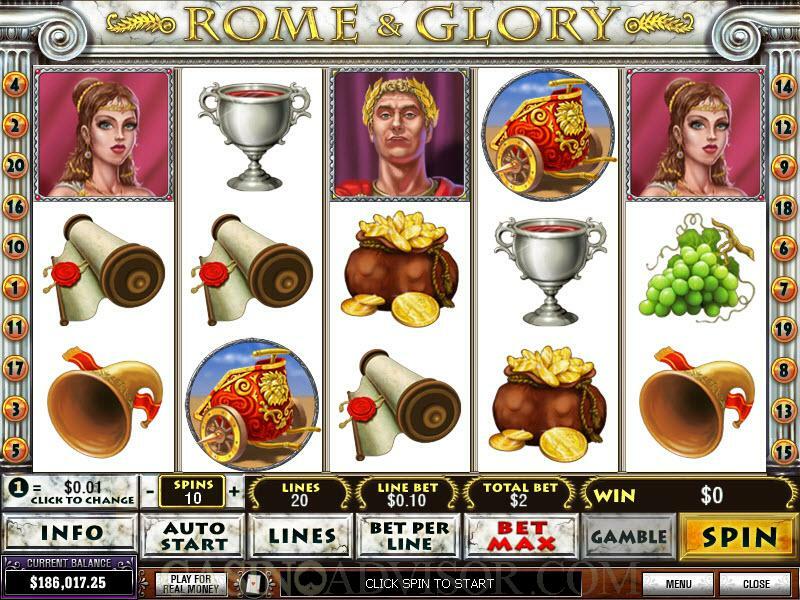 Ancient Rome is a popular theme for online slots. 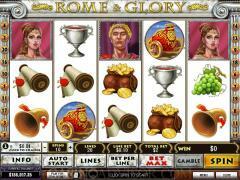 Rome & Glory from Playtech depicts both the glory of ancient Rome and its decadence through symbols on the reels. The glory is represented though symbols like Banner, Chariot and Scroll whereas the decadence is represented through Grapes, Wine Cup and Gold. The highest payouts are offered by Caesar and Roman Lady. The Coliseum, the most known building of ancient Rome, is both the wild symbol and the scatter symbol. The use of icons from ancient Rome instead of high value cards enhances the thematic value of the slot game. 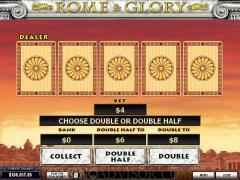 Rome & Glory is a 5 reel and 20 payline online slot game. Players can select the number of paylines by clicking the Lines button. Players can wager up to 10 coins per payline by clicking the Bet per Line button. The maximum values in both can be simultaneously selected by clacking the Bet Max button. Then the players need to choose the coin denomination. The choice available to the players is from 0.01, 0.05, 0.10, 0.25, 0.50, 1.00, 2.00 and 5.00. The payout table and game rules can be accessed by clicking the Info button. The Coliseum functions as both the wild symbol and the scatter symbol. It offers only scatter payouts when three or more symbols appear anywhere on the reels. Three or more scatter symbols also trigger the free spins bonus round. Only 10 free spins are offered at normal payouts. The highlight of the free spins bonus round is a mystery scatter. One of the symbols is randomly chosen to function as a scatter symbol during the free spins round. This symbol will then payout as per the per its original pay table but with the coins multiplied by the total bet. For example if the Caesar symbol is the mystery scatter and four of them appear scattered on the reels then the payout is 1000 coins. If the total bet is 200 credits then the payout in credits will be 200,000. 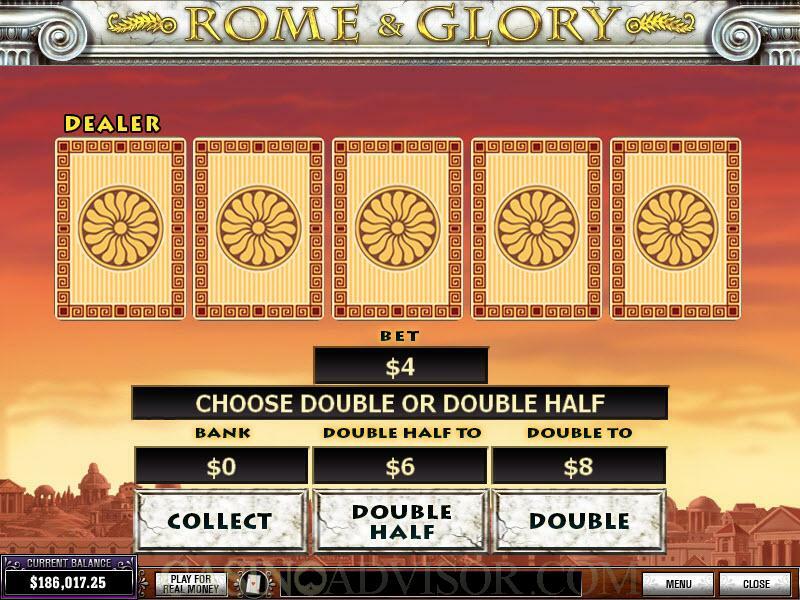 Rome & Glory also has a Gamble Game that is slightly different from the usual offering. Five cards are dealt face down and the dealer’s card, the first one, is exposed. The player has to pick one of the other four cards. If that card is higher ranked than the dealer’s card then the staked amount is doubled, otherwise the staked amount is lost. Also the player does not have to stake his entire winning if he wants to play the Gamble Game. He can collect half and stake half. That way he can have the best of both options. The limit for the gamble amount is 1250.00 credits. Interested in reading more detailed information about Rome & Glory? If so Click Here for more details.